Ellar Coltrane and Lorelei Linklater wear black, brown leather, and optical white Converse “Chuck Taylor” All Stars in the film. Mason and Samantha are putting out Obama signs in 2008. Boyhood combines a time-lapse sequence with film, conveying the reality of growing up in America. Filmed over a 12 year period, the film follows the life of Mason (Ellar Coltrane), a child of divorce, from the ages of six to eighteen. His single mother, Olivia (Patricia Arquette), reroutes Mason and his older sister Samantha (Lorelei Linklater) across Texas in an attempt to recover the family from the aftermath of their flaky father (Ethan Hawke). In the subsequent 12 years, we watch as life gets the best and worst of the family—all with an authenticity that skips any Hollywood exaggeration. Mason and his father go on a camping trip together. Olivia pursues a college degree with the hope of stabilization, finds a constructive career, and unfortunately falls into two more failed relationships. This allows for major exploration of father figures. Initially, Mason’s father wayward appearance and noncommittal role initiated him as the bad guy. But, the step fathers reveal that devastating troubles can lurk beneath a pristine exterior. We see the dark effects of alcoholism and post-traumatic stress syndrome, diseases all too common in the modern age. With it all, Mason’s ebb and flow bond with his own father begins to strengthen. For the first time, Mason and his dad really bond, and have good conversations about life..
Mason’s upbringing eventually develops his philosophy on life and his overall demeanor. The audience’s slow discovery of Mason’s personality calls for an intimate connection with him. You feel like you know him, like you watched him grow up—because in a way you have. As he falls in love and discovers his passions, you root for him and you understand him on a level that film typically can’t reach. Boyhood is one of those films that captivates you, but you don’t immediately understand why. The plot is rather flat, and only in reflection do you realize that it’s the truthfulness of the film that affects you. This is the family next door, Mason is the kid next to you in class—or maybe he’s even you. Now a senior in high school, Mason goes to Austin with his girlfriend, Sheena. Director Richard Linklater is to thank for this entrancing flow. It must have taken a leap of faith and jolt of courage to plan 12 years ahead, trusting in the dedication of the main cast—but it all paid off. Boyhood plays out like a documentary, and every detail was thoughtfully placed—from the evolving popular music, to the uprising of Harry Potter, to the advent of iPods. The rawness of the actors creates a necessary effect, too, made only through the consistency of the actors over time. All the awkward stages are celebrated — the zits, the angst-inducing punk phases, and the devastation of a first love gone sour. It’s a realism that flows through the ending scene, making us think that somewhere out there the whole family still exists. And you’re rooting for them still. Sheena breaks up with Mason just before their graduation from high school. 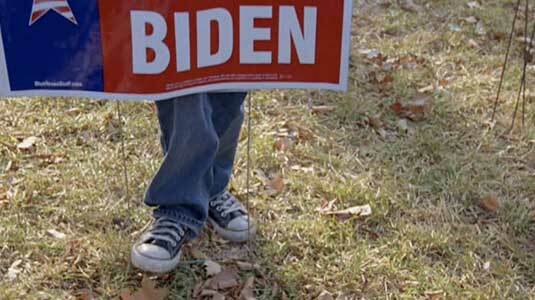 The camera focuses on Mason’s black high top chucks at the start of the campaign sign scene. Over the twelve years of his boyhood, Ellar Coltrane in his role as Mason, is seen wearing black high top and low cut chucks, and brown leather high top chucks in many of the scenes. His sister in the film, Samatha (Lorelei Linklater), is seen wearing optical white chucks in a few scenes. Wearing chucks should be a part of everyone’s growing up, so it is cool to see them in this coming of age film. Mason takes off his chucks before junping into the water. Boyhood. (2014) Patricia Arquette, Ellar Coltrane, Lorelei Linklater, Ethan Hawke, Elijah Smith, Steven Prince, Marco Perella, Jamie Howard. Written and directed by Richard Linklater. Categories: Drama, Coming of Age, Teenagers.